The family of Chelmsford woman who died a day after thyroid surgery at Brockton Hospital was awarded $14.5 million by Middlesex County, Massachusetts jury in a medical malpractice case this week after five hours of deliberation. Pursuant to a favorable provision of Massachusetts law, the award included more than $5 million in interest. Plaintiff’s decedent was a 30-year-old woman who went to the doctor because of a lump on her thyroid gland. Her surgeons did a biopsy on the benign lump but in recovery, someone noticed that her abdomen was swollen and her stomach and legs had turned blue. She apparently developed abdominal compartment syndrome from the air that had gotten into her stomach. The doctors did what they should have done initially. The operated again and released the air. Unfortunately, the surgeons immediately closed the wound immediately without letter all of the air escape. She was flown to Boston Medical Center for surgery but died later that day. I cannot imagine how this case went to trial. 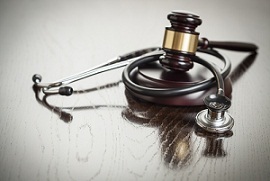 Often the doctor’s medical malpractice lawyers defend these cases on the basis of the difficulty of diagnosis of abdominal compartment because it often occurs in patients with other causes of circulatory or respiratory failure. So the plaintiff’s medical malpractice claim is usually defended on the basis that the doctor did not diagnose abdominal compartment syndrome because the patient’s symptomology was consistent with other problems and the patient died or suffered a severe injury before the condition was uncovered. In this Boston medical malpractice case, the diagnosis was not the problem. Instead, it was the conduct after of the doctors after they knew of the condition that led to the medical malpractice. One more comment about the case: when the woman was in trouble, they transported her by helicopter to another Boston hospital. If I’m getting elective surgery, I much rather do it at the hospital where they are going to be sending me if a problem does occur. Compartment syndrome occurs when a fixed compartment, delineated by myofascial layers and/or bone is subject to increasing pressure, leading to vascular compromise and ischemia. This condition is a true medical emergency. It is important for doctors to look for this if there are signs and symptoms. There is no definitive test. Compartment syndrome is a diagnosis of exclusion in many ways. But trauma doctors and orthopedic doctors are familiar with how to measure compartment pressures and they know what a big deal it is if you have compartmental syndrome. The most simple way to measure it is with a compartment tester. It is a quick test to administer. In just a few minutes, you have information that might make the diagnosis. Some people think you need a broken bone to have compartmental syndrome. You don’t. When you after an accident and there is great pain that is not proportional to what you would expect, that is a sign you need to dig further to look for compartmental syndrome. Abdominal compartmental syndrome (ACS) is commonly associated with limb trauma. But it can occur, like in did in the case we are talking about above, in the abdomen. ACS has a high mortality rate if it goes undiagnosed and untreated. Prompt recognition and appropriate intervention are required in order to preserve organ function and prevent death. Intra-abdominal hypertension is defined as an intra-abdominal pressure of greater than 12 mm Hg. Abdominal compartment syndrome is defined as pressure greater than 20 mm Hg, in association with new organ dysfunction (e.g., kidney failure, respiratory dysfunction, etc.). Intra-abdominal hypertension is graded, I-IV as follows: grade I, 12-15; grade II, 16-20; grade III, 21-25; and grade IV, above 25. The signs and symptoms of ACS include hypotension, metabolic acidosis, respiratory decompensation and hypercarbia, oliguria or anuria, an unexpected increase in abdominal size, and tenseness of the abdominal wall. The first line of treatment of ACS is sedation and paralysis to relax the abdominal wall, evacuation of intestinal contents, drainage of ascites or other intra-abdominal or retroperitoneal fluid collections, and optimizing systemic pressure. If the blood pressure is reasonable, you want to begin to off-load the excess fluid via diuresis. If these more conservative treatments fail, decompressive laparotomy is necessary. You can find the Boston Globe story on this case here.